C.W. 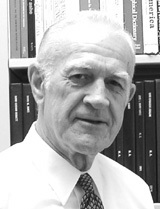 “Bud” Minkel is professor of geography at the University of Tennessee-Knoxville. He has written and contributed to hundreds of publications, and is considered the dean of Latin Americanist geography. Before the “art” in cARTography can be executed, information must be gathered. As in the art itself, the acquisition of source material has changed radically. 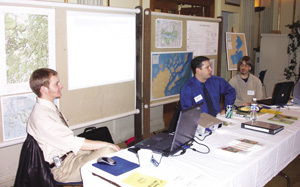 Prior to the computer revolution and development of the Internet, Mapping Specialists relied on print media and expert advice to ensure accuracy of the map. To be sure, the Internet has enhanced access to data and detail, though some information appears not to have been edited thoroughly. MSL does consider as reliable information that is posted on official government sites and reputable research organizations such as encyclopedia providers. However, we still rely considerably on specialists in geography, history, and other academic disciplines to guide us to truth and accuracy. One such expert is C.W. “Bud” Minkel, professor of geography at the University of Tennessee, Knoxville. 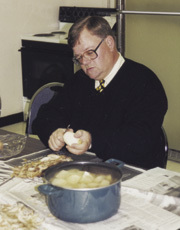 Bud’s career spans many years from his undergraduate days at Colorado State College to his doctorate at Syracuse University under the tutelage of the eminent Latin Americanist, Preston E. James. Here, he began a career as a specialist in the geography of Latin America. To Bud, Latin America is all the land area in the Western Hemisphere south of the U.S.
Over the years, Bud has made 125 trips to the region. He has advised governments in the region on national and regional planning and has been a principal in the Pan American Institute of Geography and History, of which he was president. A most recent activity was as the principal U.S. member of the team that helped to settle the Peru/Ecuador boundary dispute, in 1998. Bud maintains that Latin American countries have made impressive strides in infrastructure development, such as road construction and water/sewerage systems, in recent years. He notes that the countries also have become more democratic and responsive to citizens’ needs. A major accomplishment is that many countries have become less dependent on a single export, such as coffee, and therefore diversified their respective economies. Latin America does have persistent problems, however. These include a very high birth rate and massive rural to urban migration. These problems cause high unemployment or underemployment and do not diminish the gap between the very poor and the wealthy. Generally, the U.S. populace is reasonably informed concerning Latin America, its characteristics and problems, according to Bud. But, he is concerned that there is a woeful lack of real understanding of the region. Few Americans can identify the unique features of the individual countries, their leading export, historical background, or political agenda. An example would be to relate how Brazil differs from the other counties – its size, population, language, or history. After so many trips to Latin America, Bud still enjoys returning to Guatemala City, Guatemala; Quito, Ecuador; Santiago, Chile; and Lima and Piura, both in Peru. This relates to the many personal and professional friends he has made there during his career. Bud has helped MSL acquire Spanish language sources and advised us on the proper display of information that deals with Latin America. For this we are very thankful. Because of this guidance, we are able to provide the most accurate and up-to-date maps to you, our clients. The CEO on KP duty at the Thanksgiving Dinner. 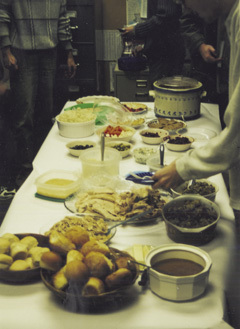 Even the FedEx and UPS drivers get along at the Thanksgiving Dinner. MSL table at GIS Day at UW-Madison. 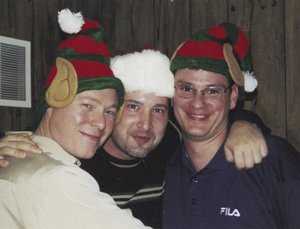 Matt, Joe, and John at the staff Holiday Party. 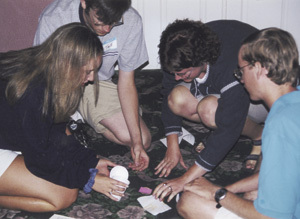 A team-building exercise at the 2000 Annual Meeting in Wisconsin Dells. Annual Brewer baseball outing at Miller Park in Milwaukee. 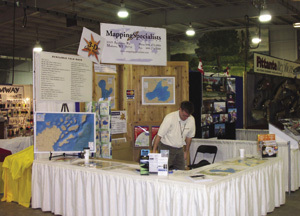 MSL Lake Map booth at the Madison Fishing Expo. Eat you heart out – the annual Thanksgiving Dinner. 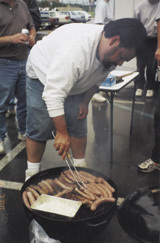 Bratman Dave at the annual Bratfest. 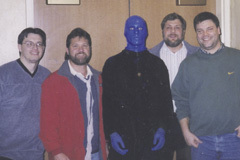 The Blue Man Group show at the 2001 Strategic Planning Meeting in Las Vegas. 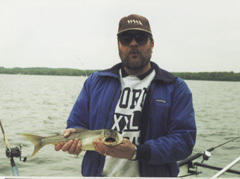 Al catches the big one at the 2000 Strategic Planning Meeting in Green Lake, WI. Hi mom! 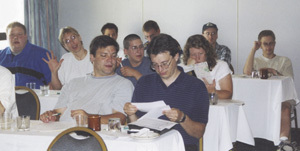 2001 Annual Meeting in Oconomowoc, WI. From balls and strikes to bits and bytes, Joe Benash is a real team player. Joe is Mapping Specialists’ newest project manager, appointed in June 2003. A good all-around guy, he has shown leadership both at work and on the baseball diamond. 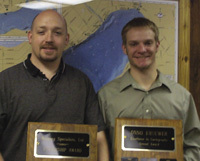 Joe joined MSL in March 1997 after graduation from the University of Wisconsin-Oshkosh. He majored in geography with an emphasis in geographic information systems (GIS) and geology. Because of this background, Joe is a natural to be assigned to manage projects involved with data management such as transformation of public land survey system (PLSS) data and digitizing land records. Geography became an interest to Joe at an early age. His father’s job required frequent family moves. 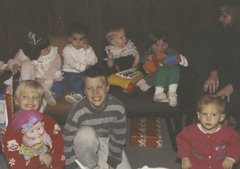 He was born in Evansville, WI, but between first and fourth grades, the family moved to San Antonio, TX, to Saginaw, MI, then back to San Antonio. While living in Texas, Joe learned one of the most important lessons of life – the value of a dollar. He persuaded a younger neighbor boy to sell Joe the boy’s go-cart for the princely sum of a bi-centennial quarter! The young lad had never seen such a coin and jumped at the deal. So, Joe proceeded to buy some paint and engine parts. Soon Joe raced his new ride around the neighborhood. A prince indeed! Then the hammer came down. The young neighbor boy’s parents found out. Joe had to return the go-cart, was grounded for two weeks, and was out the $20.00 he spent on parts…and, you guessed it, a quarter! But, soon things settled down somewhat. The family moved back to Evansville where Joe graduated from high school, excelling on the baseball diamond. 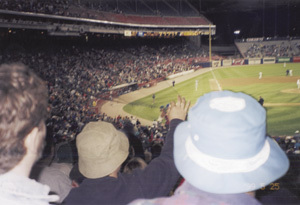 This guided him to Oshkosh, where he kept his interest in America’s favorite pastime. He continues playing the game as a second baseman for a competitive fast pitch softball team today. Joe also is an assistant coach for a local high school girl’s softball team. 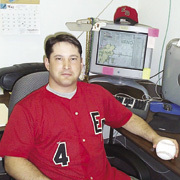 Joe’s 18-year involvement in fast pitch softball has led his teams to the national tournament every year since 1994. This adds to his geographic experience since nationals have been held in Albuquerque to Fargo, Utah to Florida. Teams compete from all over the United States as well as from Canada and Japan. Last season, 2003, his team finished fourth in the national tournament where Joe was named to the all-tournament team as a second-baseman, batting .390 with a .950 fielding percentage. A true team player, Joe will go to bat, not only on the playing field for his teammates, but for you, the client.